The announcement of the Victorian Governments $45 million Homelessness and Rough Sleeping Action Plan in January 2018 provided some hope for vulnerable Victorians. The plan, led by Brotherhood of St Laurence Executive Director Tony Nicholson, is focussed on breaking the cycle of homelessness by intervening early, getting rough sleepers housed quickly and strengthening support services to keep people off the streets. Included in the plan is a commitment to spend $19 million to establish assertive outreach teams in areas of greatest need across the state – including Dandenong, Frankston, Warrnambool, Ballarat, Geelong, Bendigo, Swan Hill and Maroondah. These workers will actively seek out and engage with people experiencing homelessness and connect them with emergency accommodation, health services, and ongoing support. $9 million to tackle chronic homelessness and deliver individual support to vulnerable people once they are housed. $13 million for an additional 106 accommodation units and onsite support. $4.5m for therapeutic services to improve health, wellbeing and housing outcomes. 2016 Census data released in March 2018, revealed 116,427 Australians are experiencing homelessness1, up 13.7% since 2011. Of the 116,000-people counted as homeless, 43,552 (39%) were people under 251. In Victoria, this equates to 24,817 people experiencing homelessness. People under 25 make up 40% of Victoria’s homeless population. People living in ‘severely’ crowded dwellings (i.e. usual residents of dwellings which needed four or more extra bedrooms to accommodate them adequately) have been the largest homeless group in each of the last four Censuses. Overcrowding is a major contributor to youth homelessness. 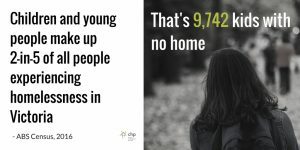 Many of the young people we support are dealing with trauma & grief, family homes are often overcrowded & mental health issues can really affect relationships within the home.